Security forces are seen at the site of a bomb attack at a supermarket in the city of Pattani, Thailand May 9, 2017. The Thai government is looking at a range of policy steps, including stepped up security, to restore confidence in the economy of the southern border provinces in the wake of a recent insurgent attack on a super store. The explosion from a car bomb on May 9 parked outside the Big C super store left at least 60 people injured, but no fatalities thanks to prompt action by security guards to close access after a small decoy blast. Panitan Wattanayagorn, a security advisor to the government, said the government is looking to policies, including economic incentives, to boost confidence. “The recovery of the supermarket is on the way. The government sent special representatives, [Deputy Prime Minister] General Udomdej [Sitabutr] were in the area a few times to assist in the recovery of the supermarket, including the reopening to return to normalcy. We are told that very soon in a matter of days that the supermarket will be fully reopened,” Panitan said. The store is the only one of its type in the largely Muslim Southern border provinces of Yala, Narathiwat and Pattani, which have a population of 2 million. Anusak Suwanmongkol, owner of the CS Pattani Hotel, which has also been targeted, said the attack marked another blow to the local economy. “It will affect the investment climate, it will affect the economy in general because the indiscriminate attack on the people who go to Big C supermarket and overall it will take some time for the economy to pick up,” Anusak said. Thailand’s southern border province insurgency reignited in 2004, and since has claimed almost 7,000 lives despite intense security. Victims of the conflict have largely been Muslim, while attacks on symbols of the Thai state have included the torching of state schools and the murder of scores of teachers, and state officials. Thai security forces have also been accused by rights groups of extrajudicial killings and torture. Along with the human toll, the region has also suffered economically from the conflict. The state-run think tank, the National Economic and Social Development Board (NESDB), in a 2015 assessment, said the southern border regions faced low or negative growth. The NESDB said the regions suffered low personal incomes and poverty rates of 33 percent -- well above the Thai national average of 7.2 percent. Srisompob Jitiromsri, a political scientist at the Prince of Songkla University Pattani campus, said years of conflict have left a mark on the local economy. 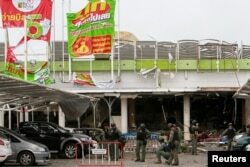 Military personnel inspect the site of a bomb attack at a supermarket in Pattani, Thailand, May 10, 2017. “The problem of the violent situation and the lack of confidence is the investment from outside (of the region). It has a strong impact on the local economy. This is why we can see the poverty still high when compared with other regions," he said. The conflict has also seen the flight of many in the local minority Buddhist population. In 2003, the National Statistics Office (NSO) said some 22 percent of those living in the three provinces identified as Buddhists. But Srisompob said since then the Buddhist population, threatened by the conflict, has fallen to less than 10 percent. The World Bank, in a April 2017 assessment, warned that household income and consumption disparities in Thailand — including the Southern provinces — were "significant and growing." Since 2004, successive Thai Governments have initiated spending and development policies to boost local incomes, along with support from non-governmental organizations and United Nations backed programs. Panitan said the key Southern Border Provinces Administrative Center (SBPAC) has channeled aid into the region. “The SBPAC in particular has schemes and compensation measures to assist the local economy. This is not the first time that local commercial centers have been attacked. So they have different packages to assist the recovery including loan and compensation,” he said. Thai fiscal spending on the region has stood at $7.36 billion since 2004. In 2016 alone, the allocation was $858 million - more than double the 2004 budget of $375 million. But Anusak said only an end to violence will lead to a return of business confidence. “In order to have potential investors to come in the area to establish business you usually have to also have safety, you have to establish safety, you have to establish a safe climate also,” Anusak said.